Why I'm Not Now and Have Never Been the Democrats' "Rush Limbaugh"
The Republican machine kept attacking me but the American public sided with me—not Rush Limbaugh. I have watched with mild amusement this week the self-immolation of the Republican Party as it bows before the altar of Rush Limbaugh, begging for mercy, pleading for forgiveness, breathlessly seeking guidance and wisdom from The Oracle. President Obama and the Democratic Party have wasted no time in pointing out to the American people this marriage from hell, tying Rush like a rock around the collective Republican neck and hoping for its quick descent to the netherworld of irrelevance. But some commentators ( Richard Wolffe of Newsweek, Chuck Todd of NBC News, etc.) have likened this to "what Republicans tried to do to the Democrats with Michael Moore." Perhaps. But there is one central difference: What I have believed in, and what I have stood for in these past eight years—an end to the war, establishing universal health care, closing Guantánamo and banning torture, making the rich pay more tax and aggressively going after the corporate chiefs on Wall Street—these are all things which the MAJORITY of Americans believe in, too. That's why in November the majority voted for the guy I voted for. The majority of Americans rejected the ideology of Rush and embraced the same issues I have raised consistently in my movies and books. What made the Republicans so sure that Americans would recoil upon the mere mention of my name, or by simply showing a photo of my face? During this past election, a Democrat in Michigan, Mark Schauer, was running against the incumbent Republican congressman, Rep. Tim Walberg. Schauer asked me to endorse him and campaign for him, and I did. The Republicans were thrilled. They acted like they had been handed manna from heaven. They filled the airwaves with attack ads showing pictures of me and asking voters, 'is this the guy you want influencing your congressman?' The voters of western Michigan said "YES!" and threw the Republican out of office. The newly elected congressman told me his poll numbers had gone up once the Republicans started running ads likening him to me. There have been over a half-dozen attack documentaries on me ("Michael Moore Hates America," "Fahrenhype 9/11," etc. ), plus a feature film starring Kelsey Grammer and James Woods that had me being slapped silly for 83 minutes. Several books have been written by the Right in a concerted attempt to denounce me. One book, "100 People Who Are Screwing Up America," had me listed at #1. The author was so sure people would know why, he didn't even bother to write a chapter on me like he did for the other 99. You just get to the end of the book and all it says is "#1" with nothing but a big picture of me that takes up a full page. The result of this was one colossal backfire. The more they attacked me, the more the public decided to check out who this "devil" was and what he was saying. And—oops!—more than a few people liked what they saw. Overnight I went from having a small, loyal following to having millions go to movie theaters to watch... documentaries? Wow. Yes, the more the Right went after me, the more people got to hear what I was saying—and eventually the majority, for some strange reason, ended up agreeing with me—not Rush Limbaugh—and elected Barack Obama as President of the United States, a man who promised to end the war, bring about universal health care, close Guantánamo, stop torture, tax the rich, and rein in the abusive masters of Wall Street. Think about this road I've traveled. At the beginning of the Bush years, I was pretty much an outsider, referred to as being on the "far left." I usually found myself holding viewpoints that differed from the majority of the people in this country. When I spoke out against the war—before it even started—I was marginalized by the mainstream media and then booed off the Oscar stage in " liberal Hollywood" for commenting about a "fictitious" president. Seventy percent of the public back then supported the war and approved of the job George W. Bush was doing. Mark McKinnon, a top adviser in President George W. Bush's campaigns, acknowledged the value of picking a divisive opponent. "We used a similar strategy by making Michael Moore the face of the Democratic Party," he said of the documentary filmmaker. In the end it all proved to be a big strategic mistake on their part. Thanks to the Republican attacks on me, average Joes and Janes started to listen to what I had to say. Contrary to Richard Wolffe's assessment that "there were no Democrats as far as I can remember who were saying they stood with Michael Moore," Democrats, in fact, have stood side by side with me during all of this. Here's the Congressional Black Caucus supporting me on Capitol Hill in 2004. Here's Terry McAuliffe, the head of the Democratic National Committee, enthusiastically attending the premiere of "Fahrenheit 9/11" with two dozen senators and members of Congress. Here's a group of Democratic congresspeople endorsing my film "Sicko" in the chambers of the House Judiciary Committee in 2007. And here's President Jimmy Carter inviting me to sit with him in his box at the Democratic National Convention. Far from making me into a pariah, the Republicans helped the Democratic leadership realize that to identify themselves publicly with me meant reaching the millions who followed and supported my work. Though John Kerry lost in 2004, my focus that year had been to get young voters registered and out to vote (I visited over 60 campuses). And so, just a few short months after the release of "Fahrenheit 9/11," America's young voters became the only age group that John Kerry won. They set a new record for the largest 18- to 24-year-old turnout since 1972, when 18-year-olds were given the right to vote, thus sending a signal about what would happen four years later with the youth revolution that ignited Obama's campaign. After "Fahrenheit," I kept speaking out, the Republican machine kept attacking me, and two years later, in 2006, the American public sided with me—not Rush Limbaugh—and voted in the Democrats to take over both houses of Congress. And then, finally, two years after that, we won the White House. That's the difference—The American people agree with me, not Rush. The American public believes that health care is a right and not a commodity. They want tougher environmental laws and believe that global warming is real, not a myth. They believe that the rich should be taxed more. They want to go after the crooks on Wall Street who got us into this mess and the politicians who enabled them. They want more money invested in education, science, technology and infrastructure—NOT in more tax cuts for the wealthiest Americans. They believe that, whether Democrats or Republicans have been in power, wealthy corporations have been calling the shots for the past few decades and the American people's voices have not been heard as their country has slowly been driven into the ground. Our politicians and our media have been bought and paid for by the highest bidders and we don't trust them anymore. Finally—they want us to get the hell out of Iraq and to investigate the criminals who sent us there for fictitious reasons. Obama and the Democrats going after Rush is a good thing and will not do for him what the Republican attack plan did for me—namely, the majority of Americans will never be sympathetic to him because they simply don't agree with him. The days of using my name as a pejorative are now over. The right wing turned me into an accidental spokesperson for the liberal, MAJORITY agenda. Thank you, Republican Party. You helped us elect one of the most liberal senators to the presidency of the United States. We couldn't have done it without you. 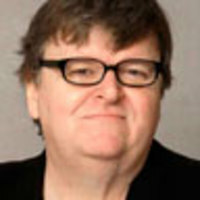 Michael Moore is an Academy Award-winning filmmaker and author. He directed and produced Roger & Me, Bowling for Columbine, Fahrenheit 9/11, and Sicko. He has also written seven books, most recently, Mike’s Election Guide 2008.